Iomega Corporation, a global leader in data storage and protection, introduced new higher capacity and dual interface models for its hugely popular Iomega eGo Portable Hard Drive, which has changed the way computer users view design and function in portable hard drives. The newest additions to the Iomega eGo Portable Hard Drive family include 160GB and 250GB models with dual USB 2.0 and FireWire 400 interfaces, available in Cherry Red, Jet Black and Alpine White. 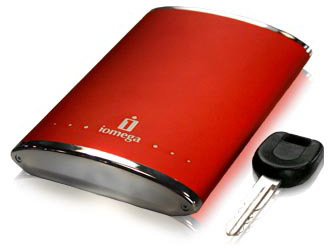 Iomega also announced today new 250GB USB 2.0-powered models in Cherry Red, Midnight Blue and Jet Black. Launched in June as a 160GB USB 2.0 Powered portable hard drive, the Iomega eGo Drive has received media accolades around the world for its style and its substance, including PC Magazine, Money magazine, the CBS Early Show and inclusion in TIME magazine's once-a-year "Tech Buyer's Guide (November 12, 2007 issue), as well as a coveted spot in TIME magazine's "Top 10 Gadgets" of 2007. Iomega's eGo Drive is a stylish and sassy 2.5-inch drive that easily fits in a briefcase or purse, giving users dependable portable storage and allowing them to express their own personal palette, popular today with colored laptop computers. The eGo Drive has an elegantly curved chassis available in several different eye-catching colors, each with chrome endcaps that sets the eGo Drive apart from other portable hard drives. 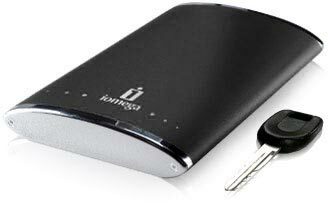 But the Iomega eGo Portable Hard Drive is also about function. No power supply is required when utilizing the USB port on any of the eGo Drive models. The dual interface models are ideal for seamless storage, backup and archive support on both PC and Mac computing systems. All Iomega eGo Portable Hard Drives come with a version of EMC Retrospect software for automatic backups, scheduled backups, or on-demand backups. DropGuard technology, another data safety advantage for eGo Drive users, protects the eGo drive from accidental damage caused by drops of up to 51 inches - far superior to the drop height specifications of other branded portable hard drives. Talk about style and lots of storage space, too - the 160GB eGo Portable Hard Drive can carry up to 640,000 photos, over 2,900 hours of music or 240 hours of video with confidence, while the 250GB eGo Portable Hard Drive can carry up to 1 million photos, over 4,600 hours of music or 375 hours of video. All Iomega eGo Portable Hard Drives are compatible with Microsoft Windows 2000 Professional, Windows XP Home/XP Professional/XP Professional x64, and Windows Vista. The eGo Portable Hard Drive is also compatible with Mac OS X 10.1.5 or above.